Academy Senior Property/Casualty Fellow Rich Gibson spoke at two events in the past week. Last Saturday he gave an overview of the Actuaries Climate Index at a symposium hosted by Tulane University in New Orleans. 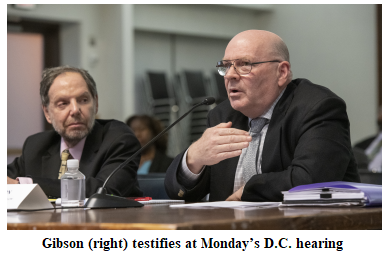 On Monday, Gibson presented at a hearing of the District of Columbia Department of Insurance, Securities and Banking on automobile insurance, where he cited the Academy’s June 2018 monograph, Big Data and the Role of The Actuary, and the Casualty Practice Council’s January comments to NAIC’s Casualty Actuarial and Statistical Task Force (CASTF) on CASTF’s recent draft white paper on predictive modeling. The Actuarial Standards Board (ASB) published a second exposure draft of a proposed new actuarial standard of practice (ASOP), Setting Assumptions. The proposed ASOP will apply to actuaries when performing actuarial services that require the setting of assumptions for which the actuary is taking responsibility, giving advice on setting assumptions, or assessing the reasonableness of assumptions set by others. The first exposure draft was issued in December 2016, and 45 comment letters were received and considered in making changes that are reflected in the second exposure draft. The comment deadline for the second exposure draft is July 31. Information on how to submit comments to the ASB can be found in the draft, which can be viewed here. The ASB released its 2018 Annual Report. Last year the ASB adopted one new ASOP and two revised ASOPs, approved five exposure drafts for comment, and approved one proposal to revise one existing ASOP. In addition, the board presented a professionalism series webinar, “The Anatomy of the ASOPs,” and provided content for several “Professionalism Counts” pieces in Actuarial Update. Join us in April for the Academy’s first professionalism webinar of 2019, “Promoting Ethical Decision-making: Rules, the Human Brain, and Unconscious Biases.” The webinar, which will be held on Thursday, April 18, from noon to 1:30 p.m. EDT, will feature an engaging discussion with a professor of business law and ethics who focuses on the fundamentals of behavioral decision-making and unconscious biases and how they affect judgment. Continuing education credit will be available. Register today. The Academy is now partnering with Blue Sky eLearn to offer webinars for our members. When registering for your first webinar with this new provider, you’ll be prompted to also register with BlueSky. For ease of future access, record the email address you use to register, as well as the password you create, so you can easily log back in to access Academy webinars. The spring StateScan Quarterly highlights recent state legislation and regulation so far this year, including casualty issues related to auto insurance, flood insurance and climate risk, and medical professional liability; health issues including the individual health insurance market, Medicaid, long-term care, and prescription drugs; life insurance issues including principle-based reserving; public pension plans; and cross-practice issues. For a more comprehensive look at state legislative and regulatory activity, log in to the StateScan portal, free for Academy members. 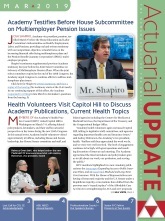 The spring Casualty Quarterly has a Q&A with Mary D. Miller, past Academy president and a former chief actuary of the state of Ohio, on the Academy’s continued engagement with the NAIC regarding the definition of “qualified actuary.” The issue also includes recent state and federal legislative and regulatory activity. Council on Professionalism member William Hines gave a presentation Tuesday on “Professionalism and Ethical Challenges” to about 60 attendees of the inaugural meeting of the Northern New England Actuaries Club in Portland, Maine. Hines reviewed the basic structures and key elements of U.S. actuarial professionalism, identified tools and resources available to help actuaries keep up to date on professionalism, and examined case studies to stimulate discussion. The Academy responded in writing to questions posed by the House Education and Labor Committee’s Subcommittee on Health, Employment, Labor, and Pensions, as a follow-up to the March 7 testimony before the subcommittee by Josh Shapiro, the Academy’s vice president, pension. The U.S. Department of Justice submitted a letter to the 5th U.S. Circuit Court of Appeals stating its determination that an appealed ruling in Texas v. Azar, currently under consideration by the court, should be affirmed. That ruling, which has been stayed pending the ongoing appeal, would invalidate the entire Affordable Care Act. Read the Academy alert. The U.S. District Court for the District of Columbia issued two rulings blocking work requirements in the Arkansas and Kentucky Medicaid programs. The rulings mark the third instance in which the court has issued decisions against the Trump administration policy allowing states to implement requirements for work or community engagement as a condition of Medicaid eligibility for certain working-age adults. Read the Academy alert. The U.S. District Court for the District of Columbia issued a ruling vacating key provisions of a U.S. Labor Department rule to broaden the scope and availability of association health plans. Read the Academy alert.